Recreating the star beast of Alien was arguably the sequel’s most deciding task. 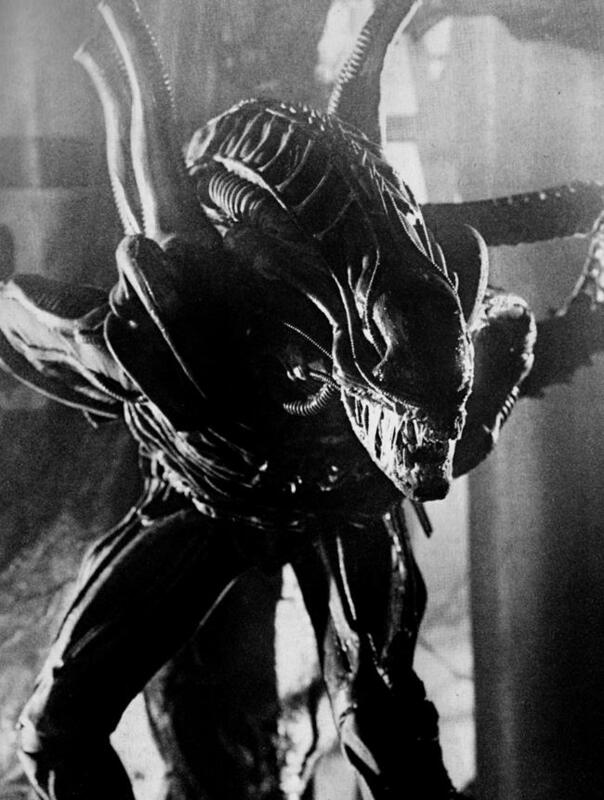 HR Giger’s original creature had reached near-mythic status among science-fiction and horror fans, but Aliens writer and director James Cameron wanted to do more than simply recreate the first eponymous Alien – he wanted to adapt Giger’s monster to the new, more grounded environment of Hadley’s Hope, reshape it for war whilst staying true to the original design, and make additions to the creature’s overall mythos without veering too wildly away from O’Bannon and Giger’s creation. 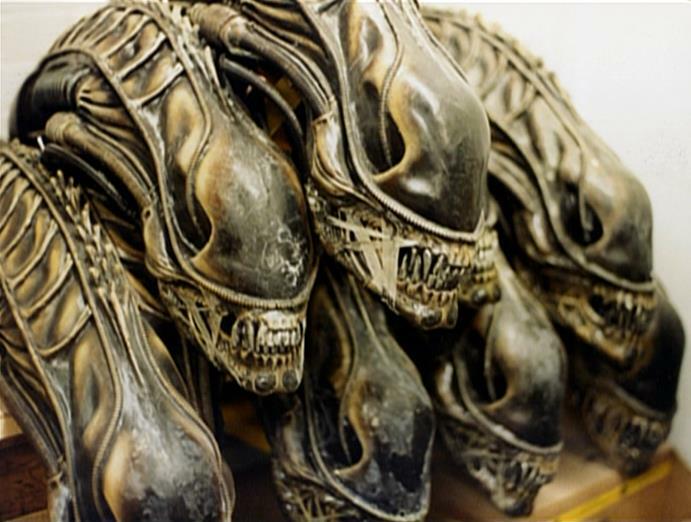 Copying Giger wholesale would have been straightforward, but Cameron felt that doing so would be a cop-out, and as an artist and designer himself, he wanted to have an influence on the Alien’s appearance. One immediate problem to tackle was the sheer number of creatures assaulting the screen. Given that the budget would only allow the creation of several Alien suits (the original had been manufactured at the cost of more than $250,000) and considering that the original suit made several movements “impossible” (according to performer Bolaji Badejo), Cameron and Winston found that slavishly re-creating it was not a viable move to make. 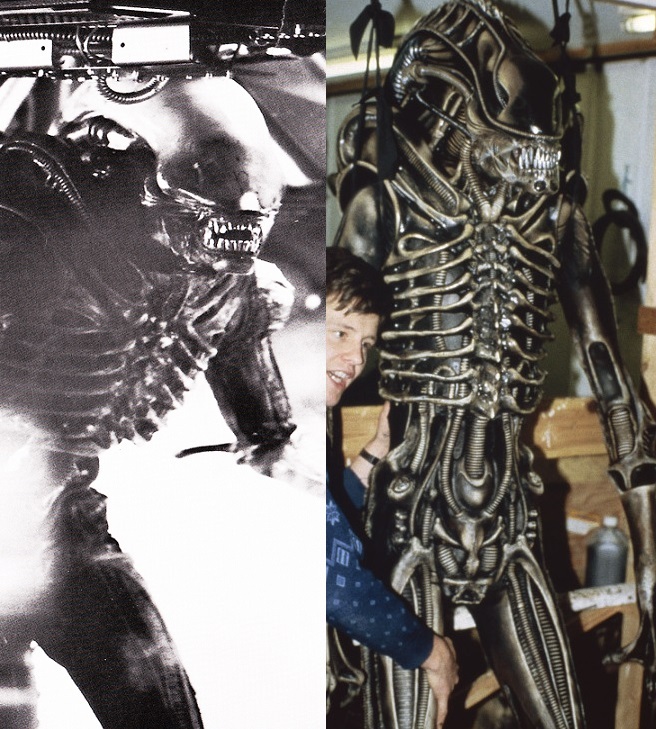 Instead, they used black unitards and pieced parts of the Alien form over the top of the material. As the emphasis was on merely suggesting the look and shape of the creature, rather than over-exposing it, the dark unitard would be hidden in shadow, with only the highlights of the Alien marauders visible in the strobing lights and muzzle flash. 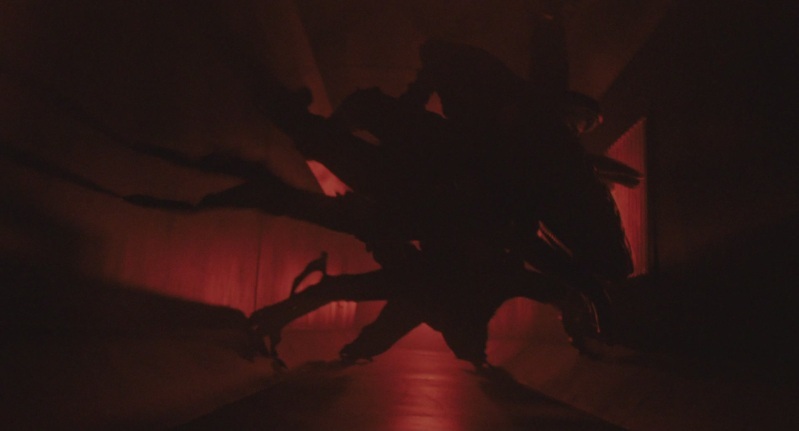 The script for the first encounter between the Colonial Marines and the Aliens constantly refers to the creatures in physically ambiguous terms, describing them as “nightmarish figure[s]”, “dark shapes”, “silhouettes”, and the encounter itself as a “battle of phantoms” – though you saw more Aliens, you didn’t see more of them. 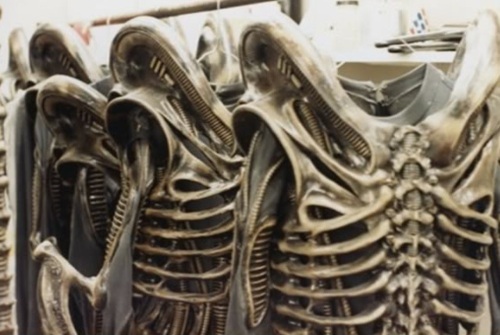 The original Alien suit was meticulously crafted, but ultimately unwieldy and cumbersome. Many shots took an inordinate amount of time to set up and film, and most footage was thrown away. Cameron’s Alien suits on the other hand would be inhabited by dancers and gymnasts who needed maximum mobility. 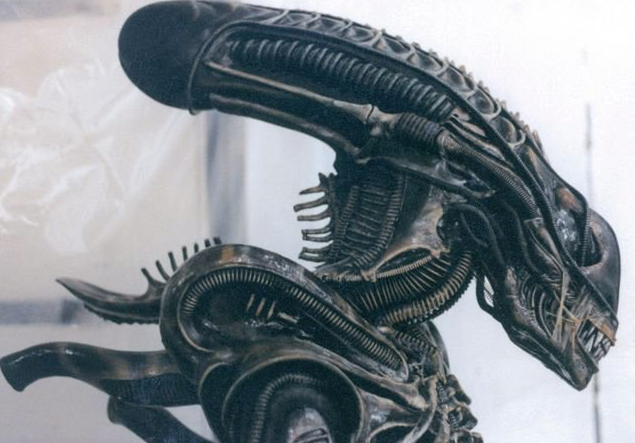 Here, we can also see Giger’s ribbed cranium and spike design, which was brought back to the surface for the sequel. Stan Winston and his team crafted a series of 8 foot tall Alien puppets that could be set into inhuman poses and could also be rigged to explode when fired upon, spraying acid in all directions. The team also exposed Giger’s ridged cranium and smoothed over the eye sockets to retain the eyeless menace of the creature, though two barely legible indents mark the sockets. ~ Stan Winston, The Winston Effect, 2006. ~ Tom Woodruff, Making of Aliens, 2003. Cameron’s concerns were allayed when he realised that Badejo only featured in certain scenes, with some of the first, infamous shots of the creature with Brett and Dallas being played by the smaller Eddie Powell. With careful editing and suggestion, Ridley Scott had fooled many viewers into thinking the Alien was consistently large. 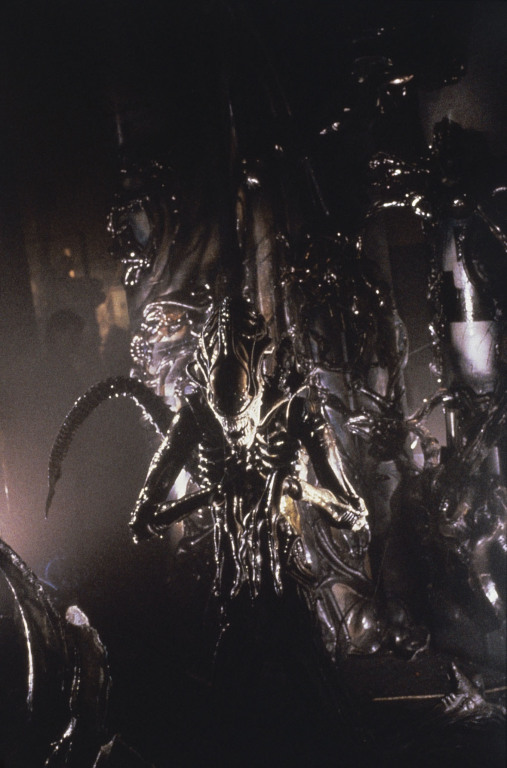 Cameron utilised Scott’s power of suggestion and editing, whilst eight-foot-tall puppets crafted by Stan Winston filled in for a larger performer (so technically speaking, the Aliens in the sequel are a full foot taller than Badejo. Or at least the puppets are.) Stunt performer Eddie Powell, who played the Alien as it kills Brett and snatches Dallas, also returned to don the suit. When they looked at the suit they found it was littered with bottle caps, macaroni pieces, oysters, bones, as well as pieces of a Rolls-Royce, all embedded onto the suit and sprayed black. For their own suits, instead of tacking and sewing pieces onto the rubber, they opted to form the tubing and pipes as small cohesive wholes or plates that could simply be glued onto the spandex undersuits in easy-to-fit chunks. ~ Howard Berger, The Winston Effect, 2006. 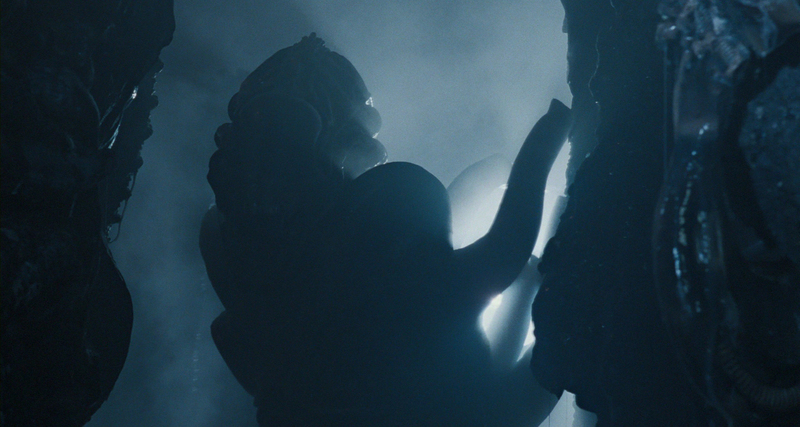 Though the body remained the same between the first two films, and the feet and hands received only minor adjustments, the most obvious change was to the Alien’s head. 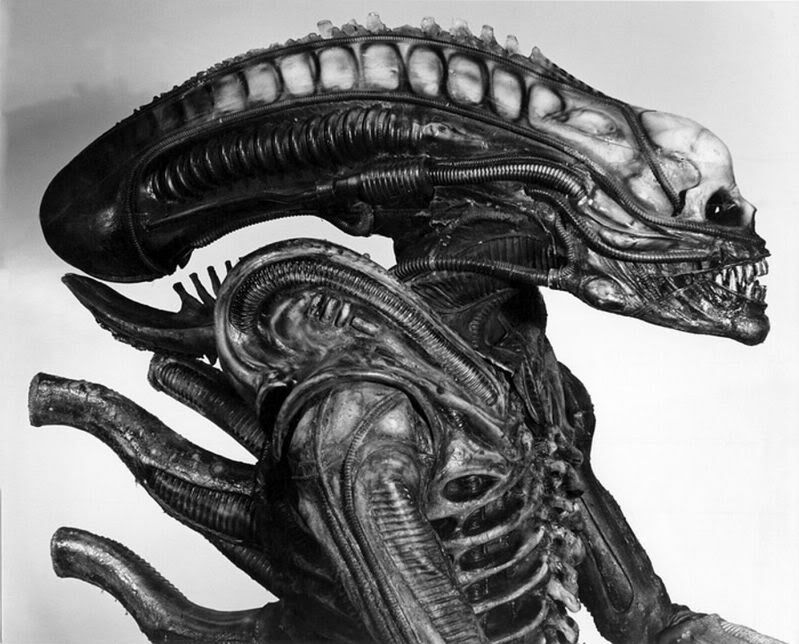 For the original film, HR Giger designed a ‘ribbed’ cranium with a skull placed at the forefront. This head was covered up with the famous dome, hiding the design underneath (though it can be spotted in some behind-the-scenes shots.) Initially, the Aliens of the sequel were to also have domed heads, but when Cameron considered the logistics he ordered that they were removed in favour of the ribbed head underneath. The lycra/spandex suits with pieces glued on top.